Last February I did a post about the miraculous resurrection of the triple arched stained-glass windows on the second-floor landing. 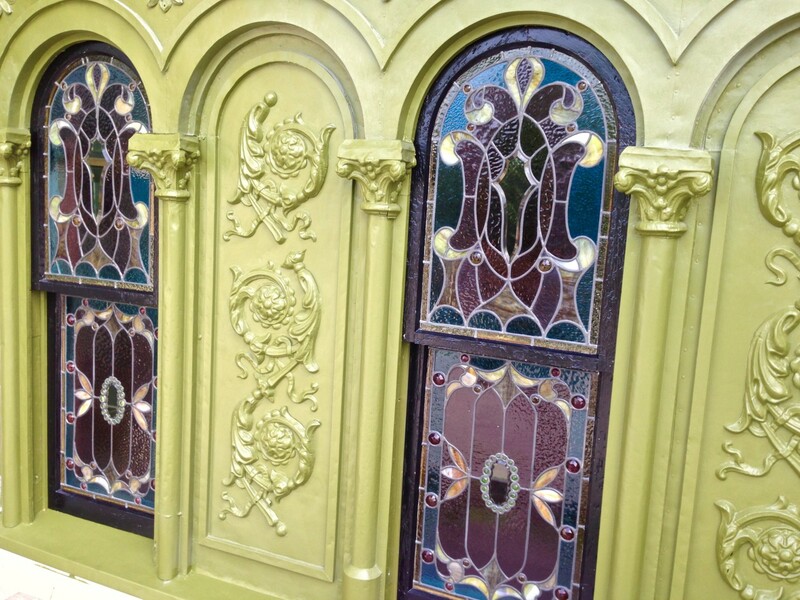 So, while the stained-glass was restored, the panels still had to be bedded in their wood sashes, which then had to be glazed, then there was a L O N G wait till the glazing dried, then the glazing and sashes needed to be primed and then painted with two coats of oil-based black plaint. And then they had to wait till I was finished painting the exterior stamped tin which surrounds, gloriously, the triple arched windows. OMG! OMG! OMG! The window on the left? I am still using it as a door. The lower sashes feature astounding beveled-glass medallions, surrounded by green jewels. Amazingly, none were damaged. If you read the post from February you will appreciate what a miracle this is. And there are red jewels, too!!!!!!!! The upper sashes feature beveled-glass centers. These, too, were miraculously undamaged. Note the gold jewels! 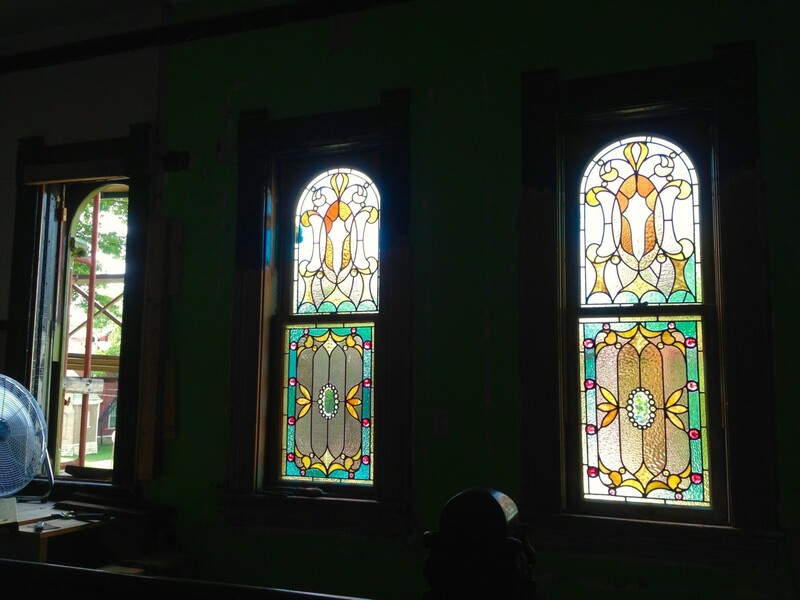 The stained-glass windows are being restored as part of the Kansas Heritage Grant. This is a program which every state should have, but almost none do. I would not have purchased the Cross House if the Heritage Grant had not existed. I knew I could not afford to restore the house, but crossed my fingers that it would prove eligible for the grant. The glory of these windows is, in part, the reward for jumping off a cliff, believing that one could fly. 22 Responses to Glory! Glory! Hallelujah! Amazing, I’m drooling all over my keyboard…wow!!! Absolutely stunning. That red jewel has my heart! Oh, Ross! So absolutely beautiful! Your joy is contagious! I once read a saying that ‘we form our buildings and then our buildings form us’. How true for the Cross House. When I look at the amazing windows and woodwork, my heart soars and rests, my spirit is raised. Congratulations, Ross! Ross, I think I hear angels singing! Breathtaking and worth every dollar, minute, and moment of angst! These pics literally caused me to weep with joy and celebration. These windows are so so beautiful – stunning. I am so proud of you Ross – so proud. I am sending you a big hug and a big “‘Atta boy”! Did you hear it? A great big cheer just went up from this chair as I am totally in awe of the beauty of those windows and so happy for you and this accomplishment. WooHoo! I did hear! You woke me up! Question for you Ross. Is there a main color in these beautiful windows? Certain rooms, first-floor vs. second-floor main color? 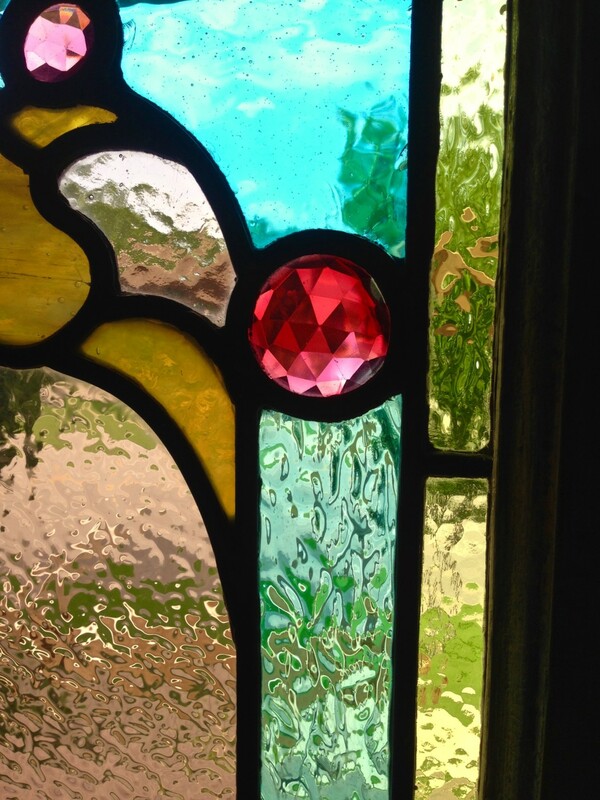 How many in each room are stained-glass? I am sorry, but I don’t remember if it was previously posted. Were any of the service rooms privy to such beauty, like maybe the butler’s pantry? As a butler would have a higher status than, say, a scullery maid. At least they do in my humble abode!! But seriously, have you ever listed a breakdown? If so, where? I can’t believe how much you have accomplished since my short time following the Cross House! 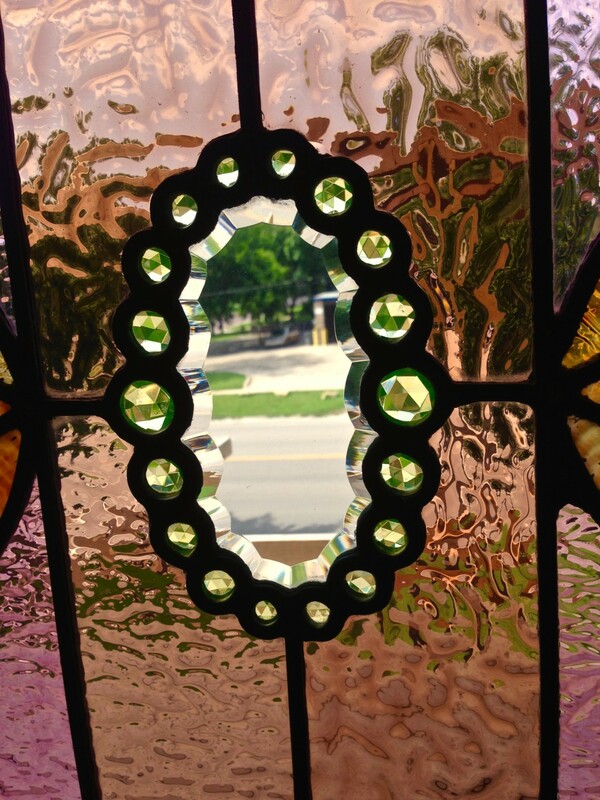 The Cross House is blessed with an extraordinary 40 stained-glass windows. Every main room on the first- and second-floors have them. They are one of the glories of the house. 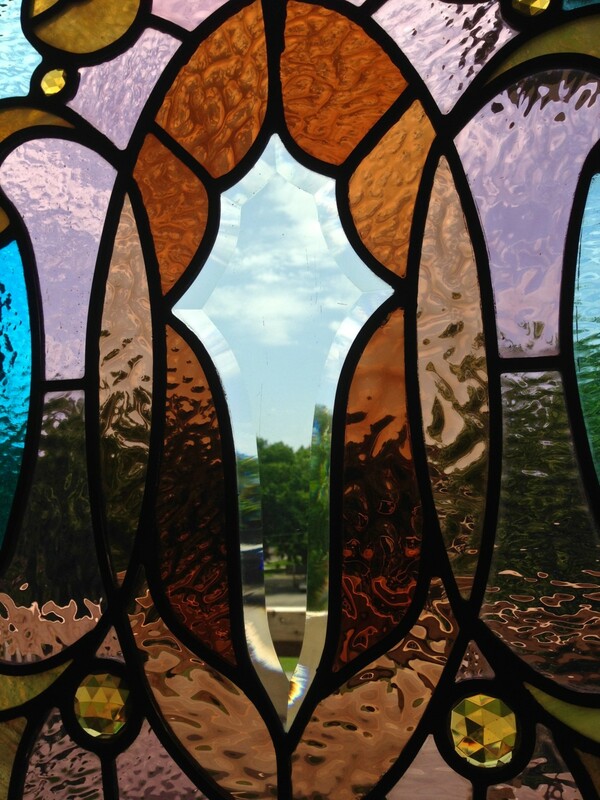 The service rooms do not have any stained-glass. I’m in complete and utter awe! Those are absolutely STUNNING!! Every time I read a new post, I fall deeper in love with your house. I’m so happy for you but honestly, happier for the house. It deserves to be brought back to life and shown off like the Grand Lady that it is! Thank you for sharing all this with us. I am happy for the house, too! I am just so jealous and happy and beaming. Wow. Ok, I need to stop gaping with my mouth open. Wow! Breath taking!